Hi, I also find the lack of a decent user guide for the L500G frustrating. I have been trying to delete a speed dial number, but while I see how to add numbers, there seems to be no option to delete one. the phone brings up the list of speed dial numbers. If there are any speed dial spots left blank, then if you select the square you'll just see the option to Add a new speed dial number. 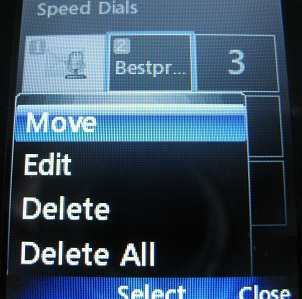 However if you select an already assigned speed dial number, you can then select Options on the lower left, and choose to Move, Edit, or Delete the number. You can even Delete All the assigned speed dial numbers except for the "1" which is hard-wired to the voicemail check number. Thanks for checking. I guess it must be possible as I did change it inadvertently but I have not been able to change it back again. I do have another speed dial set to my voicemail. You've got me there. I tried everything I could think of to change the speed dial #1 but couldn't do it. For what it's worth, the voicemail call-in number on my phone is 1-410-530-4141 which you can assign to another speed dial number if you haven't already. Thanks for your response. Unfortunately when I got the phone I inadvertently set speed dial 1 to an incorrect number (I am not sure how) and now I am unable to change it back to Voicemail. All other speed dial numbers can be changed.